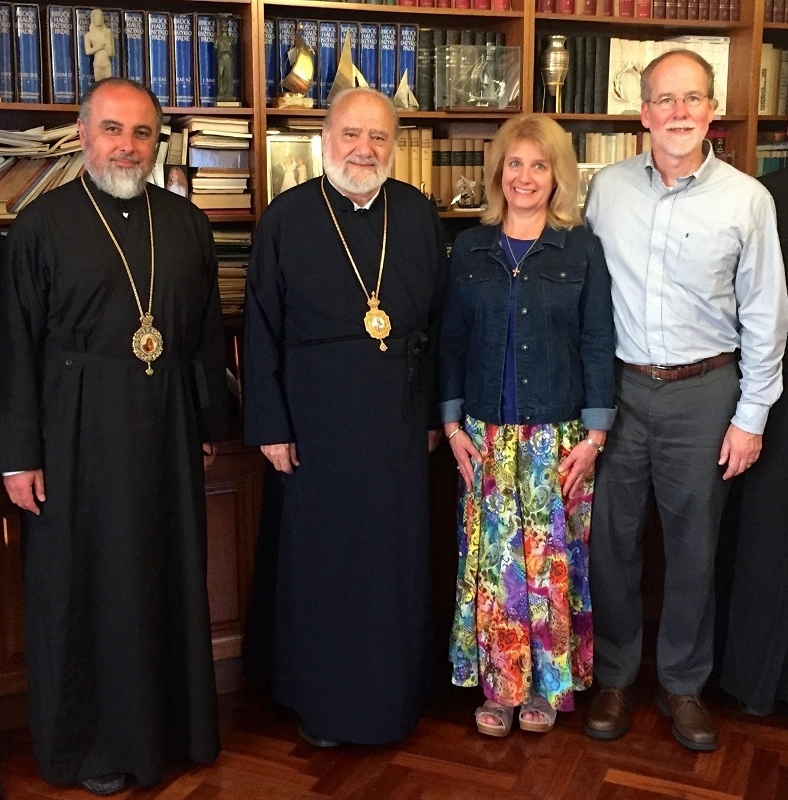 On Monday 21 September, His Eminence Archbishop Stylianos (College Dean) welcomed Professor David Bradshaw (Department of Philosophy, University of Kentucky, USA) and his wife Mrs Mary Bradshaw to St Andrew's. Here they are pictured together with His Grace Bishop Iakovos of Militoupolis (College graduate). The Bradshaws accompanied by the course coordinator, the Very Revd Fr Dr Doru Costache, and the students. Prof. Bradshaw receiving questions from the staff and students. Postgraduate and audit students listening attentively to Prof. Bradshaw (among them, Revd Fr Athanasios Giatsios). Prof. Bradshaw lecturing on the Pre-Socratics. Prof. Bradshaw presenting on Neo-Platonism. 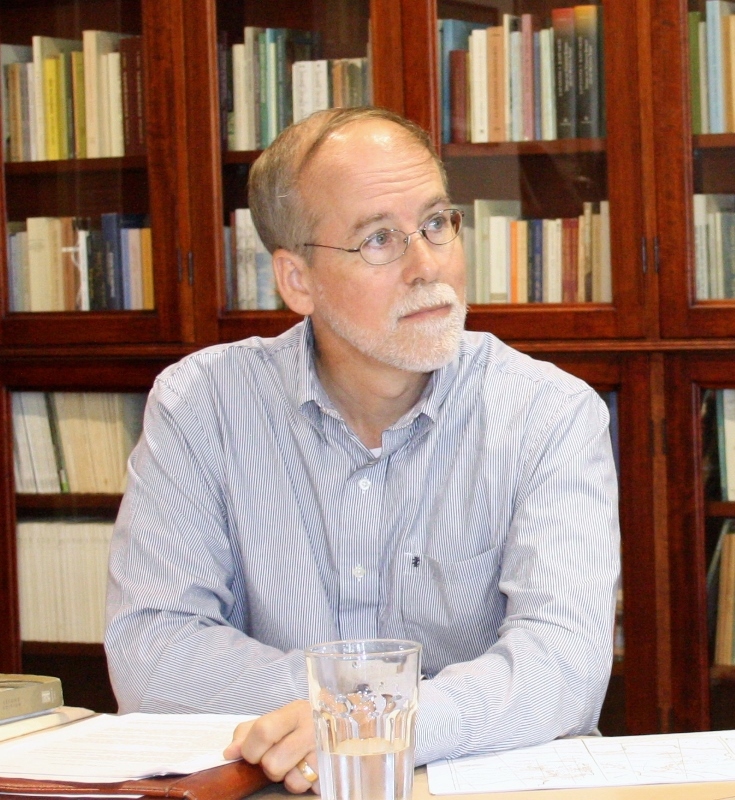 Prof. Bradshaw's public lecture, 'Why Orthodoxy Needs Ancient Greek Philosophy'. Prof. Bradshaw concluding the public lecture. 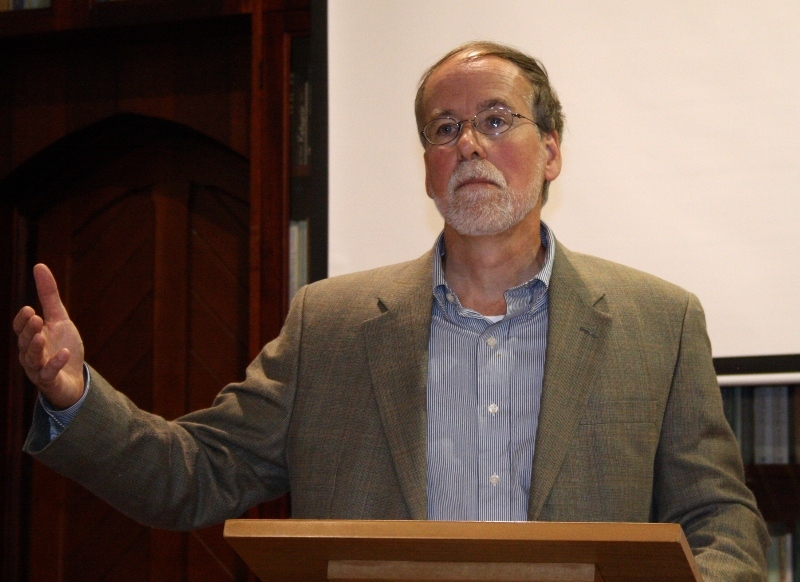 From 21-24 September 2015, St Andrew’s was proud to host for the second time the internationally renowned scholar Professor David Bradshaw (Department of Philosophy, University of Kentucky, USA) and his wife, Mrs Mary Bradshaw (both of whom are Orthodox Christians). Prof. Bradshaw has been adding to the prestige of the College over the past few years as a member of the editorial board of – and contributor to – its biannual journal, Phronema. 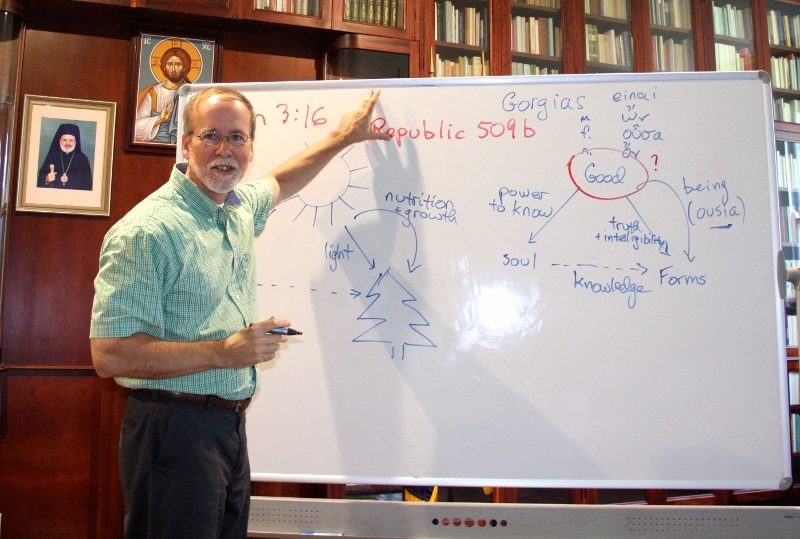 In 2013, he offered a guest lecture for the course unit TH182A/TH482A Early Christian Patristic Theology. In the same year, he was also a major speaker at the College’s Patristic Symposium on St Cyril of Alexandra, as well as its Round Table ‘Expanding Reason: the Christian Transformation of Philosophy in the World of the Fathers’. 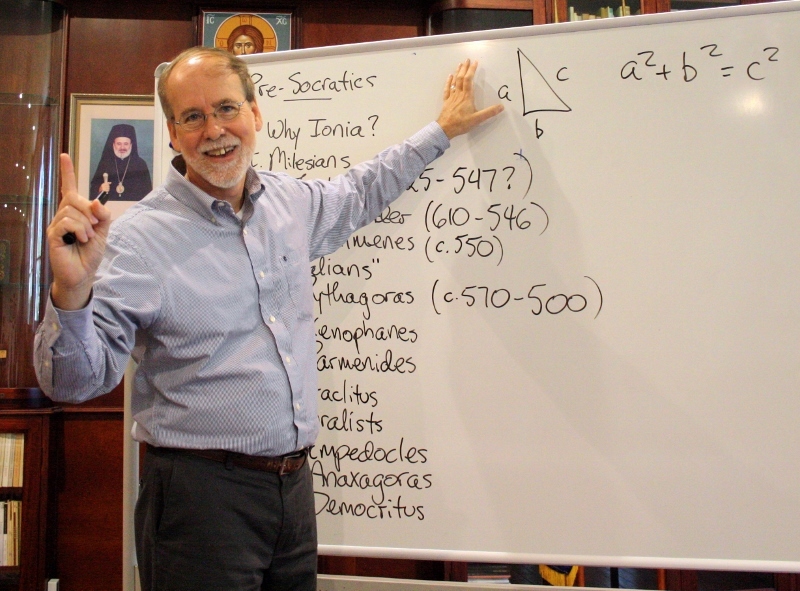 This year, over the course of four days, Prof. Bradshaw lectured for the course unit T9695A Classical Philosophy and the Church Fathers, coordinated by Protopresbyter Dr Doru Costache (Senior Lecturer in Patristic Studies). On Tuesday 22 September, he also delivered the public lecture ‘Why Orthodoxy Needs Ancient Greek Philosophy’ to an audience of fifty people (many of whom were first-time visitors to the College). The lectures were met with much enthusiasm and acclaim. St Andrew’s wishes to thank Prof. Bradshaw for his general altruism and masterful presentation of the subject matter. 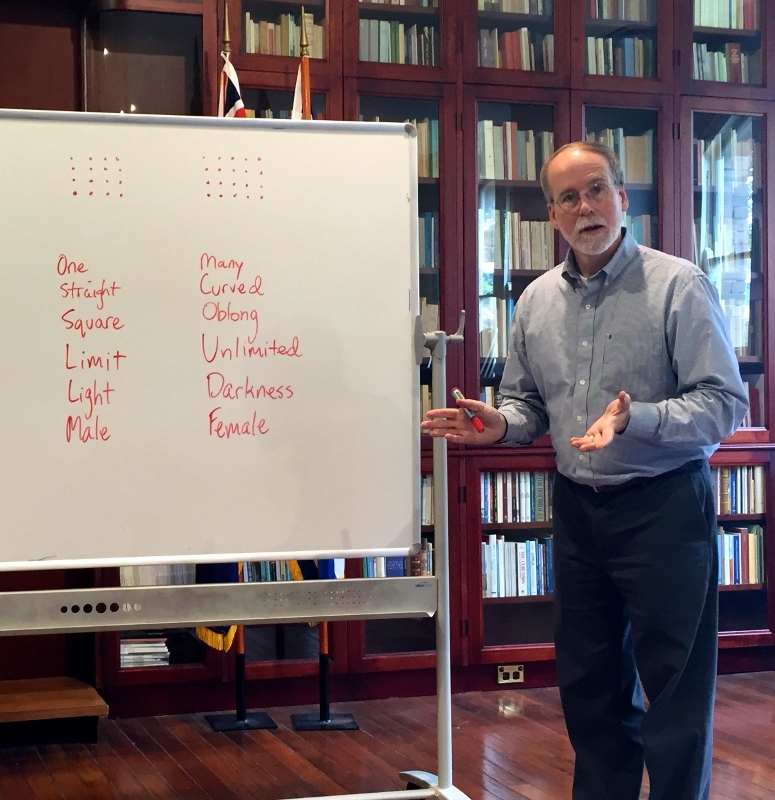 He provided the Orthodox faithful in Australia a rare opportunity to learn about their tradition’s relation and reaction to: Pre-Socratic philosophy, Pythagorism, Platonism, Aristotelianism, Epicureanism, Scepticism, Stoicism, and Neo-Platonism. He also pointed out the relevance of classical and late antique philosophy for everyday life. It is needless to state that we hope that he will continue to cross the Pacific in order to share his philosophical insights.